Hayden Christensen, who portrayed Anakin Skywalker in Episodes II and III, stars in Jumper this February, directed by Doug Liman (Bourne Identity, Mr. and Mrs. Smith). Co-stars will include Samuel L. Jackson and Nathalie Cox (of the upcoming Star Wars: The Force Unleashed video game). Looks like thrill-a-minute stuff — check out the trailer here. WizardWorld.com recently posted a list of 20 things Star Wars fans have to look forward to in the future, including the CG animated Clone Wars series, the live-action TV series, The Force Unleashed video game, Fanboys, Hasbro’s Star Wars Mighty Muggs, and a whole bunch more to keep your Force-sense tingling. Head on over to WizardWorld.com to check it out. In May 2007, filmmaker George Lucas was interviewed on stage at the D: All Things Digital, the annual tech and media conference sponsored by The Wall Street Journal, where he chatted about digital visual effects, new gaming technology developed by LucasArts and ILM, the future of Web entertainment and filmmaking in general. The interview hosted by Walt Mossberg and Kara Swisher also veers into tangents about his Lucas’ thoughts on Youtube, hedge-fund investors trying to act as film producers and more. Saturday, fans witnessed some rare insights into the story, characters, and development of the next chapter in the Star Wars saga, LucasArts’ Star Wars: The Force Unleashed video game. Set during the “dark times” between Episodes III and IV, Star Wars: The Force Unleashed portrays the previously untold story of Darth Vader’s Secret Apprentice, and is due for release in 2008. On hand were Project Lead Haden Blackman and Producer Julio Torres along with Secret Apprentice actor Sam Witwer. 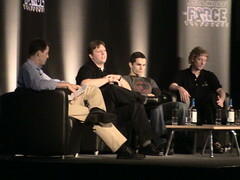 The panel featured the debut of a new Force Unleashed trailer, the first time actual game play footage has been revealed. The trailer can now be viewed on starwars.com. Star Wars: The Force Unleashed – Official Website Launched! As its name implies, The Force Unleashed completely re-imagines the scope and scale of the Force by taking full advantage of newly developed technologies that will be seen and experienced for the first time: Digital Molecular Matter (DMM), by Pixelux Entertainment, and euphoria by NaturalMotion Ltd. Paired with the powerful Havok Physics™ system, these new technologies create gameplay only possible on the new generation of consoles. DMM incorporates the physical properties of anything in the environment so that everything reacts exactly like it should – wood breaks like wood, glass shatters like glass, plants on the planet Felucia bend like plants on the planet Felucia would, and more. Meanwhile, as a revolutionary behavioral-simulation engine, euphoria enables interactive characters to move, act and even think like actual human beings, adapting their behavior on the fly and resulting in a different payoff every single time. It’ll be a game like no other, click here to visit the Official Site now! We just got some exciting news about Star Wars: The Force Unleashed. Tomorrow (Thursday, July 12) evening, “Entertainment Tonight” is scheduled to host the world TV premiere of a special preview of “The Force Unleashed,” including the very first look anywhere at the trailer for the next chapter of the Star Wars Saga, which debuts from LucasArts in Spring 2008. Be sure to check your local listings for the exact time and channel in your area, then tune in to “Entertainment Tonight” for this special preview of this exciting new Star Wars adventure! Lucasfilm has become synonymous the breakthrough digital entertainment, so it’s fitting that George Lucas be a key guest at the D: All Things Digital conference. Check out their coverage of the event here, particularly the video in which Lucas describes his move to television, internet video, and why you shouldn’t invest in the film business. And as a bonus, there’s a Force Unleashed demo with LucasArts president Jim Ward. You are currently browsing the archives for the The Force Unleashed category.